Jacquizz Rodgers and Jameis Winston tried to lead the Buccaneers to an early scoring drive, but Winston was picked off by Jabrill Peppers just outside of the endzone on their first drive. DeShone Kizer was able to lead the Browns to a field goal scoring drive off that interception. The first touchdown wouldn’t be scored until after the two minute warning, but it would prove to be the difference. A Kevin Hogan pass found Jordan Leslie in the endzone and would put the Browns up for a final score of 13-9. With that. we give you our PFF exclusive takeaways from the contest for each team. While the final stat line wasn’t pretty for Kizer in his first NFL start, there were some encouraging signs to go with the rough moments – notably, a willingness to pull the trigger downfield. Of his 16 aimed passes, 14 traveled at least 10 yards in the air, and he showed solid chemistry with Corey Coleman, connecting with his receiver for several first downs, including a dime at 6:40 of the first quarter. Overall, there was improvement over his performance a week ago, but there’s still plenty for the coaches to harp on, including a pair of turnover-worthy throws, the second of the two(and the more egregious) being a dropped potential pick-six by Tampa corner Ryan Smith near the end of the first half. Apart from a false start penalty and a pressure ceded to defensive end Robert Ayers, the Browns’ stalwart at left tackle looked to be close to regular season form in his 28 snaps. He was clean on 14 other pass rushes, while making several positive blocks in the run game, both solo at the line of scrimmage and as part of a double team. Garrett showed why he was the No. 1 overall pick, rarely staying blocked and picking up four pressures (one quarterback hit, three hurries) on 23 rushes. If not for the quick passing game, those numbers would have been through the roof as Garrett slipped off blocks consistently as a pass-rusher. Peppers caught Winston’s misfire for the interception and he closed quickly for a third-down stop in the passing game, but perhaps the big story for Peppers is how much deep safety he’s playing. 35 of his 37 snaps came at free safety, making it 77 of 81 snaps so far this preseason. Peppers was expected to be more of a box safety coming out of college, but he’s showing well in more of a true free safety role. It was another mixed bag for Winston, who struggled with his accuracy in the early going including an errant pass that led to an easy interception by Browns safety Jabrill Peppers. He also missed two potential first-down throws, but in typical Winston fashion, he came back with plenty of strong throws, his best being an out route right on the numbers of tight end Cameron Brate for 16 yards. Last season, Winston had the second-highest percentage of positively-graded plays but also the ninth-highest percentage of negatives, and this game was right in line with his usual level of play. 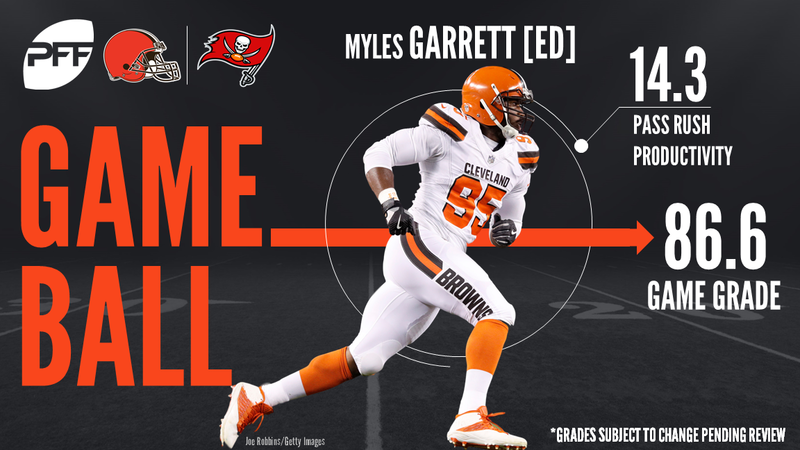 Smith made strides as a pass protector down the stretch last season, but he had his struggles in this one, particularly against rookie edge rusher Myles Garrett. Smith was lucky that Winston was getting the ball out of his hands so quickly because he rarely blocked Garrett cleanly and the one quarterback hit and four hurries don’t do justice to the number of other times Smith lost a block in under 2.3 seconds. Spence followed up a solid showing last week with another impressive performance rushing the passer, one of several notable performances among Tampa’s front four. The second-year player converted 18 rushes into two pressures (one sack, one hit) and a batted pass, along with another pair of wins. Smith had the most active game among Tampa’s defense, compiling a team-high six tackles and three defensive stops in 41 snaps. In coverage, he allowed five of eight targets to be completed for 74 yards, but made several positive plays on the three incompletions, including an excellent break on an out route at 1:43 of the second quarter, nearly getting a pick-six on Browns QB Deshon Kizer.